It’s dirty; The food is terrible; Don’t expect nice accommodations — these were just some of the concerns I’ve heard about traveling to Cuba. However, on my recent trip, I learned that most of these negative beliefs about Cuba were false, out of context, or could be easily resolved with a bit of advance preparation. Read below for some much-needed clarification on the most common misconceptions about traveling to Cuba, and answers to many of your Cuba travel questions. Be sure to check our Part 1 of this blog post: 9 COMMON MISCONCEPTIONS ABOUT TRAVELING TO CUBA: PART 1. 5) You can’t Find decent Accommodations. Most of the articles I read in preparation for Cuba warned of the same thing: don’t expect to find nice or pretty accommodations. It is true that hotels in Cuba tend to be outrageously expensive and severely dated (a 4-star hotel in Havana is not the same as a 4-star hotel in London, mind you). And, casas particulares (Cuban homestays) can be cheap but extremely basic, especially if you’re don’t plan in advance. Casas particulares are marked with blue availability signs by the front door, so it is possible to just knock on doors and ask for a room once you arrive to town. But if you plan a bit in advance, you can find some really lovely homestays on Airbnb. They’re much more affordable than hotels, and you’ll have more success finding well-decorated ones than if you just randomly knock on doors upon arrival. Our beautiful Airbnb in Trinidad, Cuba. Plus, if you read up on the Airbnb reviews, you can ensure that the accommodations are kept clean, and see if the host speaks English, is able/willing to give recommendations or help book taxis, or can cook you a delicious dinner. I found some of the most elegant options in Trinidad, but even in rural Viñales, there were charming farmhouses with breathtaking views run by hosts that seemed to double as top chefs. You’ll find the most options in Havana, of course, and it’s not uncommon for the common areas to look like they’ve been prepped for a painting, with vibrant teal or mustard walls, antique furniture, and dusty crystal chandeliers. In some cases, the common areas will be beautiful but the rooms will be basic (albeit clean), which was never a problem for me because I don’t spend much time in a bedroom anyway while traveling. Having a beautiful common room offers you a nice space in which to relax, have breakfast, or chat with your host. Hot water is hit or miss, so read up on the reviews to get an idea of what to expect at your homestay. A morning feast prepared by our Airbnb host in Vinales, and a typical breakfast served at our casas particulares. We generally had breakfast at our homestays for 5 USD/person, which including fresh fruit smoothies, tropical fruit platters, made-to-order eggs, bread with fresh preserves and butter, strong Cuban coffee, and other goodies like arepas (fluffy pancakes often served with honey — yum! ), raw veggies, coconut cake, or biscuits. It was all delicious and extremely filling. The dinner prepared by homestay hosts are no less impressive — often guests will find that their home-cooked meals were their favorites of the trip! With a little advance preparation, you’ll be able to find some clean, comfortable, and beautifully decorated accommodations with some authentic Cuban flair for around 20-50 USD/night. For 40 USD off your first Airbnb booking, sign up here! There’s no way around it: Havana is dirty. In particular, the streets of Old Havana, which can be filled with aromas of freshly baked bread and sizzling garlic one second and a whopping bomb of dog poop the next. But keep in mind that Havana is, after all, a major city. Just as New York City or Paris can sometimes earn reputations for being far from spotless, with unidentifiable stenches or drippings liquids from rooftops, Havana has yet to figure out how to keep its streets clean amidst the many stray dogs, high pedestrian traffic, and insufficient waste management in the area. However, most restaurants and casas particulares catering to tourists are kept impressively spotless. Just do your research in advance, read up on some reviews, and you probably won’t have any issues. For those in desperate need for fresh air, there are tons of nearby destinations where you can escape the signs of city life. Take a day trip to Playa del Este, a pristine white sandy beach with clear waters, or spend the afternoon strolling through the stunning, 600-hectare Jardín Botánico Nacional — both only a 30-minute drive outside of Havana. Havana’s Parque Almendares, also known as El Bosque de la Habana (“Havana’s Forest”) is right in the Vedado neighborhood, which means you don’t even need to leave the city to escape into this lush green oasis. Or, if you have a bit more time, head to the Cuban countryside to experience one of the more rural, less touristic parts of the island. In Viñales, located about 2 hours west of Havana, you can hike the serene Sierra de los Organos mountains, climb the other-worldly mogotes (steep sided, tower-like hills that emerge out of flat plains) of the Viñales Valley, tour the traditional tobacco and coffee farms, or explore the many prehistoric caves scattered throughout the region. Regions like Viñales are not only stunning, but still largely untouched, meaning lots of fresh air, with very little rubbish and traffic. Even Trinidad, albeit quite touristy, will feel like a calmer, cleaner break from Havana city life. The cobblestone streets are in the town center are spotless, and you’ll be a quick drive from the soft, white sands of Playa Ancon (noted by author Tom Miller as having “one of the best sunset vistas in the Western world”) or the wild forests and waterfalls of Parque El Cubano, without any of the rubbish I’m used to seeing lying around forests in Southeast Asia. 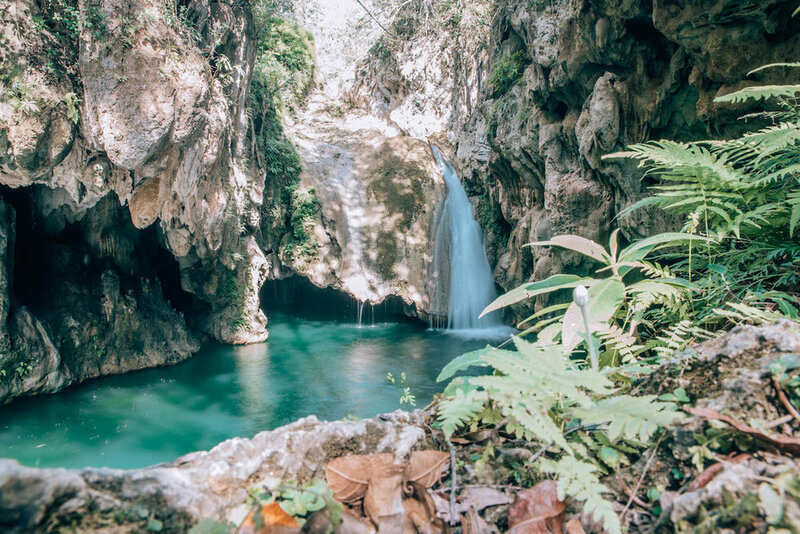 El Nicho, a massive natural paradise and one of the most beautiful parts of the island, is also just an hour and half drive away from both Trinidad and Cienfuegos, where you can spend the day hiking, chasing waterfalls, and swimming in clear turquoise pools to your heart’s content. Parque El Cubano, with clear turquoise waterfalls and beautiful nature trains, is only a 15-minute drive from Trinidad and is kept spotless. So, yes, Old Havana can be dirty, just as most major downtown areas and busy cities tend to be. But not only does Old Havana still have so much to offer that shouldn’t be overlooked due to its smelly streets — art galleries, delicious restaurants, fascinating history, stunning architecture, just to name a few — but it also comprises only a tiny part of the entire country of Cuba. Be sure to give yourself time to escape the central city and see some of the more wild, untouched parts of the island that make Cuba the tropical paradise it is. 7) It’s difficult to get around. Despite the relatively low tourism rates in Cuba as compared with other Caribbean islands, it’s fairly easy to get around as a foreigner. Taxis are everywhere, from the official state-run yellow cabs, to privately owned vintage cars, to bicycle rickshaws, to motorized carriages reminiscent of the vehicles in Mario Kart. It’s easy to snag one to get around Havana, for around 5 USD per trip (less for shorter distances within, say, Old Havana, and more if you’re heading out to the suburbs or airport). Taxis collectivos, which charge a reduced flat rate for shared rides (sometimes it’ll just be you and your travel partner, and other times you’ll be sharing the car with locals or other travelers), are good options for efficient rides over long distances. They’re much cheaper than private taxis which can charge up to 300 USD for a 4-hour trip. Plus, the drivers are familiar with typical tourist destinations, and are generally willing to help send you off on a bus or the next taxi if your Spanish is lacking (spoken from personal experience). For those on a tighter budget, you can find air conditioned buses that drive between major tourist destinations regularly (usually around twice per day). Aside from hitchhiking, buses are probably the cheapest option. In general, expect to add an hour or two (or more) to your drive if you take the bus versus a private or shared taxi. Cuba also has a state-organized hitchhiking system. Employees in yellow vests will help you catch a ride (often in the back of a truck) to your destination from designated pick-up locations. It’s obviously a bit riskier than a taxi, but much safer than hitchhiking in most places in the world, and great if you’re on a tight budget but with lots of time flexibility. Must be up for an adventure. Although it is possible to rent a car and drive around Cuba on your own, I don’t recommend it. If you get in an accident, you can be detained in the country until the investigation is finished, which can take a month or longer. And with unreliable signage, confusing traffic rules that are only sometimes followed (at times a horse or bike might have the same right of way as you), poorly maintained roads & vehicles, and unpredictable stray animals scattered along the streets, an accident is possible. You can rent a car with a chauffeur, which gives you the same flexibility and control as a rented car, but without the liability. This can cost about 90-120+ USD per day. 8) I can’t get by if I don’t speak Spanish. Although it is true that many Cubans don’t speak English, it’s also true that most are extremely patient with and undeterred by the English language barrier. Meaning, they’ll draw upon whatever English words they know, recruit passersby or phone a friend for translation help, or resort to some impressive sign language to communicate with you. Neither I nor my travel partner spoke Spanish, but I was able to get by simply by relying on my French language skills (throwing Spanish pronunciation on French words works surprisingly well), creative sign language, and lots of pointing at maps and menus. Even the terribly broken and limited Spanish I do know was astonishingly helpful, as locals were able to get an idea of what I was trying to say and fill in the blanks (bless them). Even the smallest restaurants will likely have at least some English on the menu, or at least ingredients and descriptions that you won’t struggle to translate (e.g. “tacos” and “mojitos”). Do a little food research in advance to get an idea of what to expect on menus, and check out this helpful post on common Cuban menu items. If you’re still concerned, download an offline translation app that can help you when other creative attempts won’t do the trick. Apps like iTranslate, Google Translate, and TripLingo all have offline capabilities if you pre-download language packages on WiFi beforehand. Most even have the ability to translate voice, handwritten characters, and photos of text. They’re a great backup option if you’re in a snag or are trying to have some more complex conversations with non-English-speaking locals while in Cuba. 9) There’s no WiFi in Cuba. It’s true that WiFi is not easy to come by in Cuba. Personally, I chose to completely disconnect during my week in the country, which was surprisingly easy, and extremely therapeutic. According to my phone’s screen time tracker, I was able to allocate approximately 3 hours per day toward Cuba sight-seeing that I would’ve normally spent on social media (I’m a bit embarrassed to admit that, even if my job requires me to be on Instagram pretty often). And this doesn’t include the additional hours I saved each day without browsing the web or messaging friends. But if you’re still spooked about not being able to contact friends or family, there are options for you. You’ll find WiFi zones in many parks, squares, and hotels, and even some casas particulares, where you can use a pre-purchased WiFi card. You can find the cards at hotels or Etesca telecommunications centers, or from locals selling cards independently around the WiFi zones. For an extensive list of Etesca WiFi hotspots, click here. Not sure how to find a WiFi park? Check the Etesca hotspot list linked above, or just keep an eye out for parks and squares with tons of people glued to their cell phones. WiFi will run you about 1.5 USD per hour or 7.5 USD for 5 hours, and more if you purchase at inflated rates from locals selling cards on the streets. Some hotels now even offer free WiFi cards. The connection is spotty, but it works if you’re feeling desperate. All towns have a Etesca telecommunications center, where you can purchase WiFi cards and use their available computers if you don’t have your own. Additionally, as of December 2018, Cuba now how a 3G cell network, and if your phone is unlocked you can purchase an Etesca SIM card for around 30 USD for 4 gigabytes., Certain international cellular networks also have agreements with Cuba allowing users access to roaming while on the island — it’ll be pricey, and probably not nearly as reliable as your cell networks back home, but if you’re desperate, give your cell provider a call before your trip to see what your options are. And finally, you’d be surprised at how much you can do on your phone to help you navigate a foreign country even offline. Maps.Me and Google Maps both offer downloadable area maps that can be accessed offline, using GPS tracking to tell you where you are, and how to get to certain destinations. Offline translation apps (see section 8 above), currency conversion apps (which can convert offline but obviously can’t update new conversion rates until you have internet access again), and others can help you solve many of the problems you’d encounter while traveling, all without a cell connection. But my recommendation: enjoy an excuse to unplug. You’ll find it surprisingly easy to disconnect and will quickly break those habits of periodically reaching for you phone, scrolling through Instagram, or checking emails. And it’s actually much easier to have zero WiFi access than some WiFi access, the latter being often more frustrating than it is helpful (it’s sort of like Pringles: if you don’t have any, it’s fine, but if you have half a Pringle a day, that’s torture). I hope this article has put your mind at ease about traveling to Cuba. Be sure to also read 9 COMMON MISCONCEPTIONS ABOUT TRAVELING TO CUBA: PART 1, responding to concerns about traveling to Cuba as an American, finding quality Cuban food, and other common questions and misconceptions. Any other questions about traveling to Cuba? Let me know in the comments below!